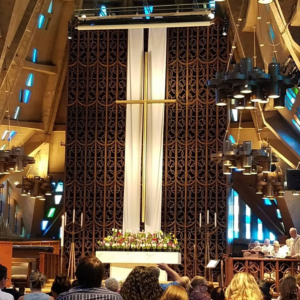 We offer two English-language Sunday worship celebrations, a contemporary service at 8:45 in the chapel and traditional 10:45 service in the sanctuary. We also have services in the Fijian and Tongan languages at our location. For more information on our services, please see our Visitor’s Info page or contact the Church Office at 650-323-6167 or info@firstpaloalto.com. During Lent, our contemporary Upstream service will be held at 6:30 PM on Wednesdays. A soup meal will be served 6:30-7 PM, followed by a community time with Bible study, prayer and singing. An alternative Bible activity will be offered for children. Think vibrant, flexible, family-friendly. The exact “liturgy” of the worship may change from week to week; the music style, instrumentation and leadership configuration may vary; how much and what kind of “movement” may fluctuate. The details may twist, turn, and dance—but these essentials of music, media, message and movement will always be there as we strive to connect with the flow of the Spirit of God within this community. If you are looking for a vibrant, spirit-filled service with a relevant message and strong musical heritage, then our 10:45 AM service in the Sanctuary will nourish your soul. Experience the expected…. and the unexpected! While our pastors and Chancel Choir may be wearing robes, the 10:45 service builds on and enhances Methodist church traditions. In addition to our chancel choir and Merritt Speidel Organ that feature in every service, FUMC has a handbells group and chamber group, Fiume di Musica, which play regularly once a month. On the first Sunday of each month we look forward to the First Tongan Church Choir and Brass Band getting us all up on our feet and clapping along to their inspiring sound. You’ll hear God’s good news proclaimed with passion and joy, and you’ll be motivated by creative and strategic thinking about how we all can integrate Christ’s mission into the life of the larger community. Every 10:45 service features a sermon and words of prayer and preparation to fit the week’s theme. Every service features a special Children’s Sermon. Children 5 and under are invited to the Noah’s Ark Nursery during the latter half of the service, and activity packets are available for children 6 and older. Children of all ages are invited to be a part of our 9:45 am Children’s Sunday School before the service begins. We also invite adults to be a part of one of our Sunday morning small groups and classes. We join together with our Fijian and Tongan brothers and sisters on the first Sunday of every month for a joint Communion service. All are welcome at the Table. Come worship with us, pray with us, sing with us, and praise God with us every Sunday morning at 10:45 am. You are welcome here! You can also watch the service on our live webcast. The First Tongan United Methodist Church of Palo Alto shares our facilities. Their services are conducted mostly in the Tongan language. On the first Sunday of every month, First Church and the members of the First Tongan Church join together at 10:45 AM for a combined worship service. This service is in English and communion is served. The remaining Sundays of the month, First Tongan Church worships in the Sanctuary at 1 PM. They also have a weekly 7 PM service on Wednesdays. For more information, please contact the Church Office at (650) 323-6167. A Fijian fellowship is part of our church. Fijian Fellowship services are conducted in the Fijian language and meet Sundays at 2:00 PM in the Chapel.